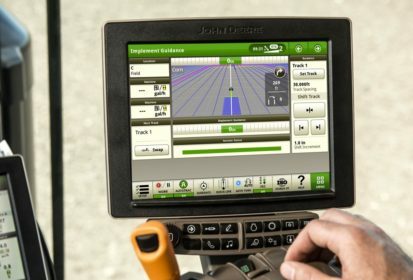 John Deere has new guidance and machine data sharing technology with the addition of three new AutoTrac applications and a new In-Field Data Sharing application for its Generation 4 Displays. AutoTrac Turn Automation makes end turns smooth, consistent and comfortable for operators during tillage, planting, seeding or other pre-emerge applications when using straight-track guidance modes. The new application for tractors provides automation across the field rather than just between headlands. AutoTrac Implement Guidance (passive) enables the tractor to move off the intended path or guidance line in order to achieve expected accuracy of the implement. The aim is to counteract implement drift which can diminish accuracy of the implement while the tractor is traveling on the guidance line. AutoTrac Vision Guidance, a previous released for John Deere 30-Series and newer sprayers, now expanded to include 7X30 large-frame, 8X30 and 8X30T, 7R and 8R/8RT tractors. AutoTrac Vision can be utilized in post-season crop applications to detect the crop row and provide input to the machine’s AutoTrac system to keep the tractor’s wheels or tracks between the crop rows.